Recognising that schizophrenia has signified a need to widen the social services safety net for Bahamians, Melanie Griffin, Minister of Social Services and Community Development noted that Urban Renewal and Social Workers are working together to effect damage control that positively impacts the rising numbers of criminal violence cases. 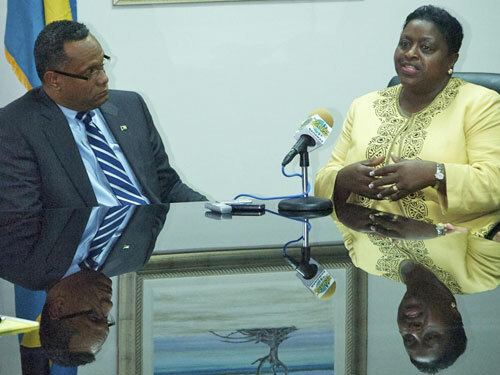 She was speaking during a February 15 courtesy call at the Ministry of Grand Bahama in Freeport. She said that pioneering anything is not easy because the way has to be paved and that staff has to be built for the work to continue. “The economic growth of this country is extremely important to all of us, particularly the Social Services because the economic growth of the country, in particularly of Grand Bahama, where we know you’ve been having a difficult time is extremely important to us because once the economy can grow and our people can find employment, the less dependent they will be on the social ministries,” said Minister Griffin. Dr. Darville discussed the strong prospects of Grand Bahama attracting tourism investors and visitors from Southern Europe and Mrs. Griffin spoke of the increase of social needs challenges Bahamians are facing in both New Providence and Grand Bahama. “We had a wonderful motivational seminar with social workers and support staff this morning under the theme, ‘Realising Our Full Potential’. I think the staff has been inspired. They have come to realise that even though there are challenges, the work that they do is much appreciated,” said Mrs. Griffin. Mrs Griffin said Social Services hopes to be back in Grand Bahama soon because the Ministry has many social challenges to overcome and a lot of work to do, however, staff is encouraged by Bahamian resilience. Dr. Darville mentioned the Government’s new welfare and social services system to improve issues with long lines at social services, and protect the dignity of those receiving assistance. He said the Social Services Department is joining forces with the Department of Statistics to measure the individuality of consumption on a national scale in a Household Living Survey. The survey results will help to implement and distribute the Conditional Cash Transfer Programme (CCT) to help the Government determine the most necessary items for each household. Social Services recipients would be able to use the deposited funds on a debit card to shop for both perishable and non-perishable items. “One of the things that came about from that survey is the CCT programme and that’s the Conditional Cash Transfer Programme, where we are going from persons having to come into social services and having to get a food coupon but having that cash put on a card that they can use in the supermarkets and they can be able to shop at anytime,” said Mrs. Lillian Quant-Forbes, Asst. Director of Social Services, in Grand Bahama.